Architect Gary Johnson has designed several Studio Vincent jewelry stores over the past twenty years. SV designs custom jewelry, its own “Muse” collection, the work of modern European designers. 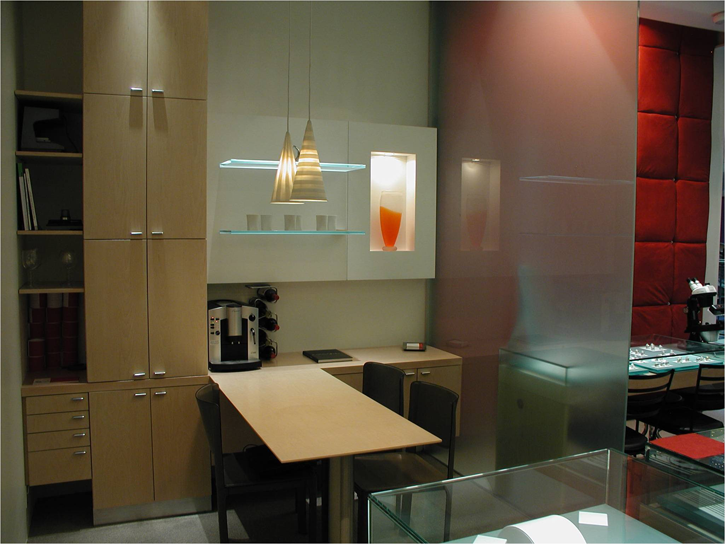 The store palette is a mix of stainless, frosted glass, and pewter stained clear maple. Floating glass cube displays glued to the storefront glass at eye level allure passersby. Below a modern interpretation of a zen garden is conveyed with a maple slab, test tubes and seasonal flowers. .